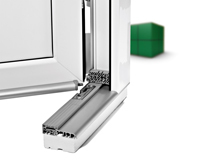 Whether made of PVC, wood, metal or wood-metal, intended for balconies or house doors, opening inwards or outwards, single or double-jamb – with the new greenteQ Threshold system TB 70-140, VBH offers its customers a complete system that combines all components and requirements, such as thermal insulation, driving rain resistance, accessibility, durability and intrusion protection. The new “Threshold system” brochure lists the articles for all variants. The new greenteQ Threshold system includes all components required for installing a threshold. These include the greenteQ Threshold TB for construction depths of 70 mm to 140 mm, greenteQ Insulating foundation profile in the combinable heights of 30 mm, 50 mm and 100 mm as well as the greenteQ MS Polymer adhesive crystal clear, greenteQ Filling pieces for processing in plastic profiles, greenteQ Weatherboarding and greenteQ Brush seals. The components fit one another optimally and can be combined individually with other accessories from the greenteQ range – VBH customers therefore receive everything from one source. “In line with our successful principle of professional window mounting, we have decided to apply the proven system concept to doors”, explains Markus Röser, Vice President of Category Management at VBH. Due to the large number of profile systems used, there has never been an overall solution for thresholds that has covered all doors and requirements. It is also often difficult to combine the required accessibility with ideal thermal insulation. However, the greenteQ Threshold system makes thermally insulated ground-level entrances possible. “Since we consider ourselves to be a service provider for our customers, we aim to offer an overall solution that meets all current requirements”, comments Markus Röser. The greenteQ Thresholds TB 70-140 consist of aluminium, anodised to a silver colour, including a cover made of UV-resistant, high-impact-resistant plastic, and can be used for PVC, wood, wood-metal and metal, regardless of the material. The constant incline of the overhang enables all profile millings with only one VBH countermill for PVC, aluminium and wood. In conjunction with greenteQ Weatherboarding, the greenteQ Brush seal and other components, a high degree of resistance to driving rain of up to 1,050 Pa can be achieved. Moreover, combined with the greenteQ Insulating foundation profile, the system arrives at optimum thermal insulation values. The insulating foundation profile is a new type of insulating construction material with the highest degree of rigidity. The long-term stability and screw mounting capability using standard window/particle board screws without the need for pre-drilling mean that it can be used in areas in which cold thermal bridges often had to be accepted in the past. Condensation and mould formation are therefore successfully prevented. All components and the new “Threshold system” brochure are now available from VBH.